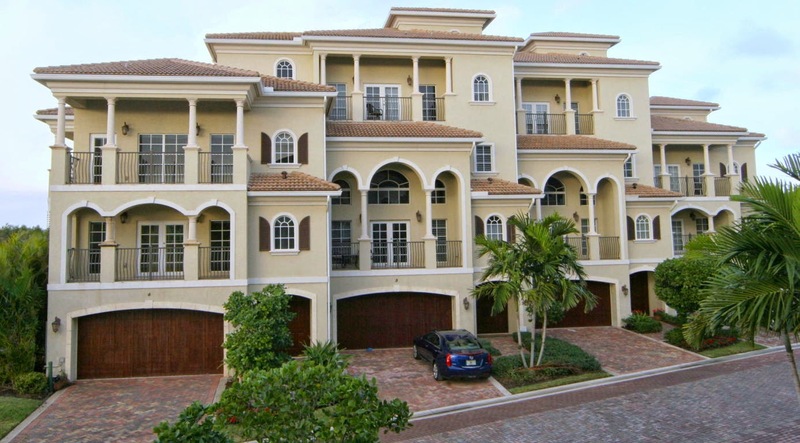 Beautifully situated within the upscale townhome community of the Tierra Del Sol in the coastal town of Jupiter, Florida is this Mediterranean inspired multi-level townhome. Set across 4 levels, all of which are accessible by private elevator, this Tierra Del Sol stunner offers over 3,200 square feet of living space with 3 bedrooms and 3.5 bathrooms. The beautifully appointed interior showcases an array of deluxe appointments including a professional grade kitchen with exquisite custom cabinetry and stainless steel appliances, marble and hardwood flooring, plantation shutters, volume ceilings, a luxurious master suite and intimate covered balconies on each floor. Experience security and serenity with superior safety features like hurricane impact windows and doors, fire doors, fire sprinklers and a state-of-the-art security camera. Additional features include a tankless water heater and booster, surround sound, central vacuum system with built-in floor sweepers and a 2-car garage. With sweeping, panoramic views of the Intracoastal, Preserve and Jupiter Lighthouse, a remarkable rooftop terrace completes this striking Tierra Del Sol townhome. 126 Tierra Ln #1 located in Jupiter, FL is located in Jupiter and is currently asking $775,000. This Tierra Del Sol listing is courtesy of Ferm Real Estate Llc MLS# RX-10119669. Tierra Del Sol is a luxury townhome community located in the sophisticated seaside town of Jupiter, Florida. Residents of this exceptional gated community enjoy several perks including a resort-style pool with spa and cabana house, professional landscaping, natural gas and a private entrance to the Jupiter Riverwalk,. The best perk of living at Tierra Del Sol, however, is its enviable location just steps from the Jupiter Riverwalk and within walking distance to the beach. World-class shopping, dining and entertainment are also just minutes away at nearby Harbourside Place.